This website is provided “as is” and although FriscoHandyman.Net makes reasonable efforts to update the information on our website, FriscoHandyman.Net makes no representations, warranties or guarantees, whether express or implied, that the content on our website is accurate, complete, or up-to-date. 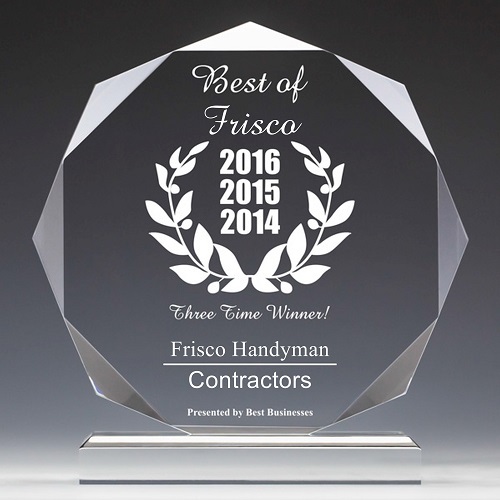 The content on the FriscoHandyman.Net website is provided for general information only. It is not intended to amount to advice on which you should rely. You must obtain professional or specialist advice before taking, or refraining from, any action on the basis of the content on the FriscoHandyman.Net website. The FriscoHandyman.Net website is made available free of charge. FriscoHandyman.Net does not guarantee that the website, or any content on it, will always be available or be uninterrupted. Access to the website is permitted on a temporary basis. FriscoHandyman.Net may suspend, withdraw, discontinue or change all or any part of the website without notice. FriscoHandyman.Net will not be liable to you if for any reason the website is unavailable at any time or for any period. You are also responsible for ensuring that all persons who access the website through your internet connection are aware of this disclaimer and other applicable terms and conditions, and that they comply with them. To the extent permitted by law, FriscoHandyman.Net exclude all conditions, warranties, representations or other terms which may apply to the website or any content on it, whether express or implied. If you are a consumer user, please note that FriscoHandyman.Net only provides our website for domestic and private use. You agree not to use the website for any commercial or business purposes, and FriscoHandyman.Net has no liability to you for any loss of profit, loss of business, business interruption, or loss of business opportunity. FriscoHandyman.Net will not be liable for any loss or damage caused by a virus, distributed denial-of-service attack, or other technologically harmful material that may infect your computer equipment, computer programs, data or other proprietary material due to your use of the website or to your downloading of any content on it, or on any website linked to it. FriscoHandyman.Net assumes no responsibility for the content of external websites linked on the website. Such links should not be interpreted as endorsement by us of those linked websites. FriscoHandyman.Net will not be liable for any loss or damage that may arise from your use of them. Different limitations and exclusions of liability will apply to liability arising as a result of the supply of any goods by use to you, which will be set out in FriscoHandyman.Net‘s Terms and conditions. You accept that, as a limited liability entity, FriscoHandyman.Net has an interest in limiting the personal liability of its officers and employees. You agree that you will not bring any claim personally against FriscoHandyman.Net‘s officers or employees in respect of any losses you suffer in connection with the website. Without prejudice to the foregoing paragraph, you agree that the limitations of warranties and liability set out in this website disclaimer will protect FriscoHandyman.Net‘s officers, employees, agents, subsidiaries, successors, assigns and sub-contractors as well as FriscoHandyman.Net.